This wonderful icon of Christ’s image on the Holy Napkin is by the hand of Simon Ushakov (1625-1668), the founder of the famous Armory Icon School at the Moscow Kremlin. 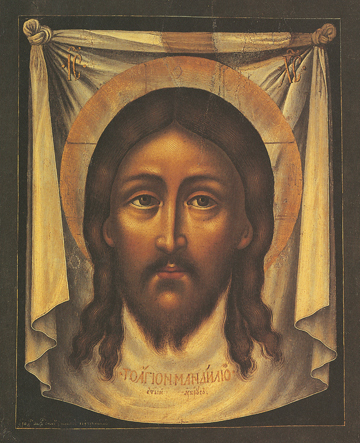 Ushakov was especially known for his mastery of the faces of the images in his icons, and this is a good example by his beautiful rendering of Christ’s lively and compassionate expression on His Face. This icon refers to the early Church Tradition that Christ made an image of Himself by pressing His face to a napkin and sending it to King Abgar of the neighboring kingdom of Edessa. The king had leprosy and believed that if he could just see an image of Christ, Whom he had heard so much about, that he would be healed, and this healing came to pass (except for one small spot on his face) when the image came to him . Christ also sent him a message telling him that one of His Disciples would come later and instruct the king. After the Ascension, the Apostle Jude Thaddeus came and baptized the king and the people of his kingdom, so that Edessa became the very first Christian kingdom. The last spot of leprosy was also healed at the time of King Abgar’s baptism.